In recent years, the method of matrix Lyapunov-like functions, which is a generalization of the classical Lyapunov direct method based on matrix-valued functions, has been significantly developed (see, for example, Martynyuk [64, 66, 69] and the references therein). Parallel to the development of the method for different classes of new equations, the structure of the matrix-valued Lyapunov functions remains of great importance and attracts an increasing attention. It is well known that the components of the matrix-valued functions depend on the system of equations under consideration, as well as on compositions of its subsystems. A natural subject for the investigation by means of the multi-component Lyapunov-like functions with different components is the class of impulsive systems. 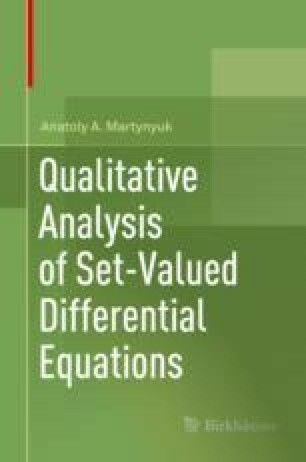 In this chapter, for the family of impulsive equations, a heterogeneous matrix-valued Lyapunov-like function is considered, the comparison principle is formulated, and the stability conditions for the set of stationary solutions are established. In addition, for a class of impulsive equations with uncertain parameter the monotone iterative technique for constructing a set of solutions is adapted.